This package includes all the amenities of the Easy Keeper Package PLUS an additional Couchtime and Outside Exercise break. This package keeps giving with 2 Peanut Butter Kongs, during their stay. They are sure to receive ample stimulation and attention with this Very Important Pet Package. Best value for your dollar! Make a Reservation today! Each guest enjoys 5 Individual Outside Times a day with a team member for potty breaks and to stretch their legs for a little exercise. Also included is our “Signature Couchtime” at NO additional cost! Make a Reservation today! A little gray in the muzzle and not moving as well as they once did? This package is for older dogs that find it a little harder getting up and down. We provide more traction with an additional Padded Rug that helps with stability and makes their stay much more comfortable. We also provide extra Exercise/Potty breaks to help keep those joints moving. All other Easy Keeper package amenities are included in this package as well. Make a Reservation today! Includes all the amenities of the Easy Keeper Package, plus additional Exercise Breaks. If your pet has energy to spare and/or is not quite potty trained (less than a year old), this is an excellent option for them! Extra Room Service is also included to keep your furry baby an all-around happy puppy. Make a Reservation today! Going to be away for the day? Need to plan some fun time and potty breaks for your canine companion? We are here for you. Drop off during our morning hours and a pick up during our evening hours. We will provide Couchtime and Exercise for your furry family member while you are way. We welcome bringing snacks in this package to keep your pet happy until they get home for their meal. Limited availability during peak seasons. Make a Reservation today! Looking for Special Requests to keep your pet in the lap of luxury? This option is for those who have requests that are outside the scope of the other packages. Ask Us! We can customize your pet’s visit to fit your expectations. (This package is for pets with large amounts of medications, behavior issues that require special handling, and any other special requests.) Make a Reservation today! This package includes all the amenities of our Easy Keeper Cat Package plus an additional Couchtime. For those who like to roam, sit and relax in the window, or play with the variety of interactive games and toys, this is the best value for your dollar! Make a Reservation today! Your cat will love their time relaxing in our multiple level luxury cat condos. This package also includes one of our “ Signature Couchtimes,” with individual one on one time with a friendly team member. Make a Reservation today! A Kong filled with peanut butter or marshmallow (Hypoallergenic pets). Our guests are pampered and spoiled while in our care. All indoor suites are kept immaculate, as they are vacuumed, hand washed, and dried. The entire facility is heated and air conditioned for your pet’s comfort. We play soft music continuously to provide soothing background noise for our guests. Our Luxury Pet Suites are equipped with raised kuranda beds and bowls, which add to your pet’s comfort and well-being. We have a security system including cameras for added protection. Along with 6’ perimeter fencing for our outside exercise yards, a team member accompanies each guest outside. Each pet receives a Signature Couchtime, one-on-one time with a team member in a living room setting with a toy box, a TV, and lots of TLC. We work hard to meet your pet’s needs. Check out our other boarding packages including our popular VIP package, which offers 2 Couchtimes! Bring your pet’s food (ready to serve) and treats. We feed up to twice a day to keep our furry guests satiated, with access to water to quench their thirst. We monitor elimination and feeding habits, along with changes in behavior. We are known for communicating with your Vet and you about any concerns. You will enjoy our daily notes about your pet’s activities, and check them out on our Facebook page enjoying their spa time. Our feline guests have a spacious Cat Condo and enjoy a Signature Couchtime, just like their canine counterparts. We make it easy; call or email your reservation request today! School breaks and holidays are a busy time, so book your pet’s vacation now. Take a test drive; come do a meet-n-greet today during our office hours. Come experience the difference! Let your pets be a part of our family while your family is away! Feline Vaccinations: Rabies, FVRCP (feline viral rhinotracheitis, calvivirus, panleukopenia). Feline Leukemia if your pet frequents outside. We ask that all vaccinations, if needed, be completed no later than 14 days prior to your pet’s visit. Flea Prevention: We require your pet to be on flea preventative. New clients need a BOARDING CONTRACT. Please bring your pet’s own FOOD, to keep them on their own routine. Special foods/diets need to be prepared prior to your pet’s stay. 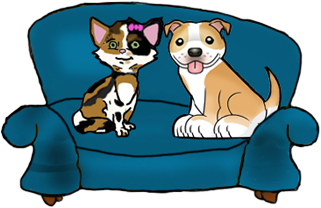 MEDICATIONS: If your pet has medication please complete a MEDICATION INFORMATION FORM. Please bring original containers. Excessive medications may incur additional charges. BELONGINGS: Please limit belongings to 5 items, to avoid additional charges. Any bedding from home must be clean, please limit size so it can be easily laundered, if soiled. We accept Cash, Check, Card, and PayPal! A three day minimum stay is required during peak seasons. We may require a deposit. We reserve the right to bathe any guest that becomes soiled during their stay. Pets will be treated at Owner’s expense if fleas or ticks are discovered. Clients will be charged your full reservation during any school breaks, holidays, June, July, and including early pick ups. Leaving your pet with us constitutes your agreement to abide by our boarding contract. Note: BOARDING IS CHARGED PER DAY REGARDLESS OF PICK-UP OR DROP-OFF TIMES. Our fees include boarding, playtime, and medications that need to be administered within reason.